In 2015, Quartzcolor and IFF products were involved in the renovation of the MOI Studio located in School of Design at Temasek Polytechnic. Because of the fast development of LED fixtures in the Production Broadcast settings, for this project we replaced all the conventional tungsten halogen fixtures with LED fresnel, without compromising on the power and quality of lights. The conventional tungsten halogen fixtures originally present in the studio have been replaced with QUARTZCOLOR 8 Studio LED X5 and 24 Studio LED X3. The Studio LED X Series range combines the matchless features of the renowned Quartzcolor Fresnel spotlights with the advantages of the LED technology innovation. It is a high performing professional LED Fresnel spotlight range whose light output is equivalent to a traditional halogen source and permits a one-for-one replacement without compromises in the quality of the light: same brightness, same smoothness, same even and shadow less illumination as a traditional Fresnel spotlight. The suspension system installed for this studio consisted on IFF Advanced Rigging suspensions, specifically 20 Acta30 Self-climbing hoists, 6 Scenery hoists and 24 Pole Operated Pantographs. All motorised hoists were, also, wired up to a centralised hoist control panel complete with a wired remote control. 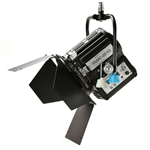 Acta 30 is the self-climbing hoist that provides an easy and fast access to install and service studio lighting fixtures with on-board motor self-climbing hoist to raise and lower lighting fixtures. SM Control Panel that was able to control up to 28 motorized Hoists. Wired Hand Held Remote Control to control directly the hoists. Scenery hoists combines innovative design with the highest standards of construction and ease of installation for payloads up to 200kg and it is ideal for suspending scenery flats, curtains, lighting, speakers and a whole list more.